While Harry Potter and the Philosopher’s Stone is an excellent introduction to the series, Harry Potter and the Chamber of Secrets brings it all up a notch. We get less Dursleys, more Weasleys. We get more Hogwarts, more Quidditch, more Voldemort, more magical creatures, more characters, more magic and, the best of all, a more concise and interesting story. 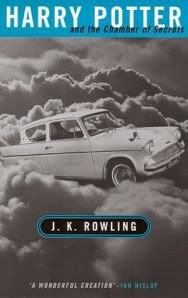 Like the first book, this one is also a mystery and it’s probably one of Rowling’s best mysteries*. Rowling also adds a real sense of danger to the school. Unlike the first book where the teachers felt confident their spells and defences would prove a suitable deterrent to anyone trying to steal the Philosopher’s Stone, some of them seem genuinely frightened at what happened at Hogwarts during Harry’s second year. I always found it a little strange when people talk about the Potter books getting “darker and darker” as they progressed. Dude, things were pretty freaking dark by the second book. Rowling brings forth interesting and important social themes to the forefront, without maybe even realizing how predominant some of these ideas become later on in the series. Rowling introduces pure-bloods, Muggle-borns (also known as mud-bloods) half-bloods and squibs. This is world building of a pretty serious kind, something that is echoed through real world history on how people treated each other based on their differences and heritage. The idea of wizard eugenics will become increasingly important to the series and it’s a pretty daring topic for Rowling to tackle, particularly in what is often considered to be a series of children’s books. This is one of the things I like about Harry Potter. The idea of pure-blood supremacy is ludicrous. The fact that Muggle-born children can grow up and learn magic is proof enough of the ridiculousness of the idea. Add to that the fact that pure-bloods or half-bloods can be Squibs, witches and wizards from magical families who are unable to use magic and the argument that pure-bloods are better weakens considerably. To put it simply, it’s a prejudice that pure-blood wizards are better because of their heritage. It’s a ludicrous idea but a very seductive one for anybody who’s part of an all-wizard family. Rowling does a good job balancing those ideas with the rest of the Potterverse. They’re very dark ideas but she handles them with seriousness. It’s a big deal when Malfoy calls Hermione a mud-blood, a slur with a very negative connotation. Essentially he’s telling Hermione that her blood is dirty, like muddy water, because her parents are Muggles. It’s such a big deal that Ron attacks Malfoy in a fit of rage. Harry Potter and the Chamber of Secrets is a very dark book, not because there are deaths abound and many gory and violent scenes. No, the series ups the ante on that in later books. The second book is dark because of the implications of pure-blood supremacy, but it’s even darker because Rowling establishes that there is a history of Muggle-born prosecution in the Wizarding World. The idea is very old, going at least all the way back to Salazar Slytherin not wanting to admit Muggle-born witches and wizards to Hogwarts. He went so far as creating the Chamber of Secrets and breeding a basilisk that would remain there, inside the school, in order to help cleanse Hogwarts of any students with dirty blood. That is pure evil. To be judged, not on your own personal merit or to even be recognized as an individual with equal value to all others simply because of whom your parents are, it doesn’t get much more evil than that. The prosecution of Muggle-borns and half-bloods doesn’t end there though, it continues on through the history of the Wizarding World. Voldemort, it’s unfortunate to say, is only the most recent example of this. I’m not sure how many young readers picked up on this but I would say the more the better because Rowling handled the issue with care. She clearly demonstrates just how wrong those ideas are and she doesn’t really limit the discussion of those ideas to just good or bad, or black or white. There are good wizards from pure-blood families and there are bad witches who are half-bloods. What blows my mind is that Voldemort is from a half-blood family. His mother was a witch and his father was a Muggle. How can you believe so strongly in the supremacy of pure-bloods if you yourself aren’t even a pure-blood by your own definition? I believe that Voldemort was in a position of such power it didn’t matter. He saw a group of individuals he was able to define as unworthy and who had already been prosecuted in times long past and continued to do so for his own wicked pleasure. Rowling will later also establish different kinds of supremacists and racial mixes such as Half-breeds (Hagrid) and wizarding supremacists (Dumbledore in his youth and Grindelwald). Now that I’ve clearly established why I think the second book kicks off the darker tone of the series and that the evolution of the series towards darker books wasn’t as drawn out as some people think, I’d like to focus on more positive elements of the series. I’m not implying that all the stuff I mentioned above is a criticism of the series. On the contrary, the presence of social themes contributes to what makes Harry Potter a good series. It also adds a big helping of verisimilitude to the world building of the Potterverse. 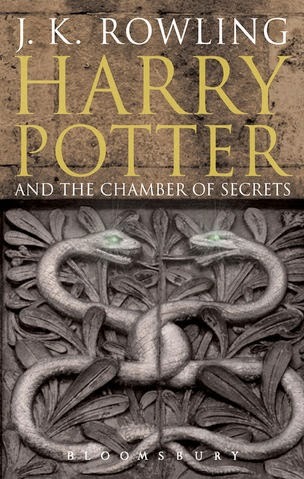 With Chambers of Secrets Rowling sticks to the formula she established in the first book. Harry has a miserable time living with the Dursleys and then he spends time in the Wizarding World before heading to Hogwarts. This year he spends the end of his summer vacation at the Burrow, home of the Weasleys. I just love how the homes of Wizards have names. It gives a nice British touch to the series and I love it. She continues with the formula once Harry arrives at school. Every year begins with some time spent with Harry and his friends in class and dealing with their homework and simply, well, going to school. It’s important because it establishes that the students don’t just run around uncovering evil plots and solving mysteries. Harry, Hermione and Ron aren’t Nancy Drew and the Hardy Boys with magic; they’re students first and foremost. Some of these moments are some of my favourite Harry Potter moments. I remember being a young teen and wishing that I could be at Hogwarts. It’s the one fictional place I wanted to visit the most when I was young. 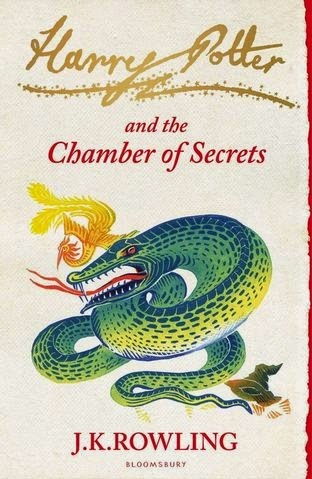 The formula continues with the development of the mystery or the event that makes the school year memorable, in this case the mystery of the Chamber of the Secrets. Generally some sort of shenanigan takes place during the Christmas break. Upon returning we get a mixture of classes and homework with some of the mystery and even a bit of Quidditch thrown in for good measure (depending on the year). The book then ends with the culmination of everything in the book for a big finale. -Ah, Arthur Weasley, you're such a strange man and so many people love you (though not as much as we love Mrs. Weasley). He's an interesting character because he's a wizard with scientific curiosity. I find this line from book two sums him up the best: "Ingenious, really how many ways Muggles have found of getting along without magic." 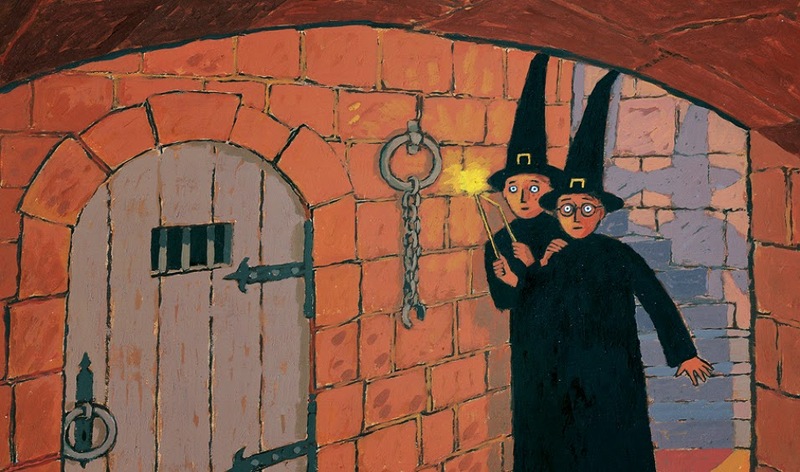 -The O.W.L.s, Ordinary Wizarding Levels, is one of the early attempts by Rowling to develop what adult wizards do for a living and how they decide what that is. The Ministry of Magic is also talked about in a bit more detail, though that will also expand considerably later on in the series. -Underage wizards are allowed to use magic in the case of emergency. What defines an emergency and who makes that definition are not specified by Rowling, at least not in this book. -Why does Snape seem to care so much about the Whomping Willow? Oh yeah, go read book three! -Professor Sprout kind of gives out her house points fast and loose, eh? She gave Hermione 20 for answering two questions correctly! -Harry's second year at school takes place from September 1992 to late spring 1993. According to Nearly Headless Nick's 500th death day (1492) I’ve never caught on to when this series occurs before. I love that it takes place during the nineties. -I wouldn't consider HP "regular" fantasy fiction yet it’s interesting that there are classic fantasy genre conventions that appear in the books. One of them that I’ve never noticed before but, I’m noticing a lot now is just how much Rowling writes about food. It’s not just at meal times and feasts, though most of it takes place during those scenes. -The biggest improvement in this book is that the first book introduces Hogwarts but the school is much more than just a place. The second book introduces the history of Hogwarts. Although the Wizarding World is new to Harry, it's been around a very long time. The second book is particularly interesting since we get our first real look at the history of Hogwarts. If there is on book I wish Rowling would write it's Hogwarts: A History. I would fit right in with the other Harry Potter “spin-off” books. -Rowling kind of tries to misdirect the reader to think Malfoy is the heir of Slytherin and he’s the one responsible for the events happening at Hogwarts. It's not nearly as effective as her misdirection with Snape in the first book. I remember just thinking it was a monster living loose in the castle and, I even remember thinking it might be a basilisk because I have just finished a French book where there was such a monster. Lucky for me otherwise I would never have guessed it. But seriously, Malfoy? Ha! I'd put my money on Lockhart before him. -Lockhart's books are popular in the Wizarding World not because of their content, but because he passes it off as non-fiction. It leads me to think about what kind of stuff wizards read. It can't be limited to magical tomes, wizard history and books about Quidditch. Part of me thinks there's a market for boring (by our real world standards) fiction. Like slice of life stuff. Maybe? I dunno. I can see Arthur Weasley just loving slice of life books. -The discovery of Moaning Myrtle is great. You get a sense that there is stuff happening at Hogwarts that's unrelated to Harry. All the girls know not to go in that bathroom because it’s haunted by the ghost of a teenage girl. I would love a book of day to day stuff with a random character, potentially ones we haven't seen before. What’s going on with other characters we’ve only briefly seen here and there? Get on it Rowling! I can’t be the only one dying to read a Harry Potter short story collection. -The Chamber of Secrets has one of the saddest moments in any of the Harry Potter books. I'm talking of course of the story of Hagrid's expulsion. There are few stories about the falsely accused as heartbreaking as this one. Who could believe that Hagrid could harm another person (or animal)? He's such a gentle soul. He's clearly thought of as a monster because of his size. Even in the wizarding world prejudices are found everywhere and even Hagrid, Hermione, and many other muggle born wizards will always suffer the oppression of those who think themselves superior not because of their deeds and personal achievements, but because of their blood and heritage. -Man, wizards can get pretty old eh? You definitively get the impression that they have a longer lifespan than Muggles. Sure, some will get way older than others based on their magical prowess or because they're half giant or something but why the longer lifespan? I would like an explanation that is more interesting than “because magic”. -One of the nice things about the invisibility cloak is that Rowling didn't over use it. Heck, for most of the book she seems to have forgotten about it. It's a good thing because it seems like she’d rather come up with new stuff rather than to repeat scenes from previous books. Still, we'll see plenty more of the invisibility cloak before the series is over. * I read in an online interview somewhere, and I’m sorry I can’t remember where because it was very good, Rowling grew up reading mystery stories and she’s always wanted to write some of her own. Well she’s done that, she’s written several in the Harry Potter series alone. Her more recent work shows that influence more prominently.